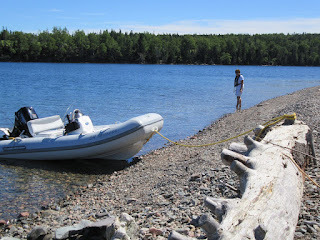 After five days at the St Peters Marina, we were all more than ready to go anchoring and exploring the Bras d’Or Lakes. 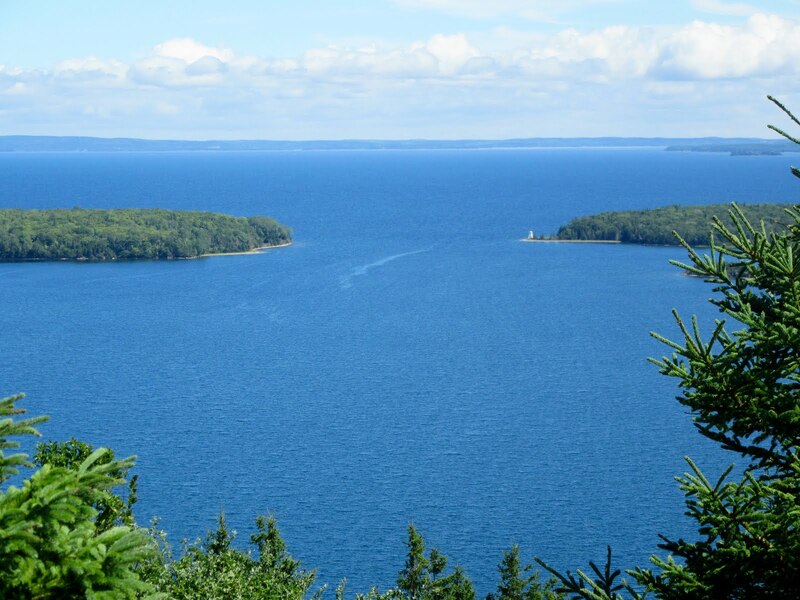 As you’ll see from the photo below, the Bras d’Or Lakes have a southwest to northeast orientation in valleys carved by the glaciers. 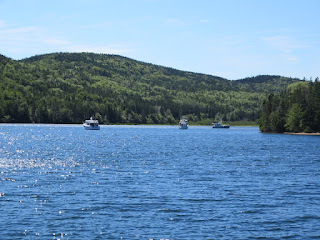 While the surrounding oceans of the Atlantic Maritimes have big seas, fog, tides, currents and other navigational challenges, the Bras d’Or Lakes have barely 6” of tide, next to no fog, moderate seas and easy navigation. We’d all been gathering local knowledge from other boaters we’d met at the marina and gradually sifted through the many recommendations to come up with a manageable list of anchorages to choose from. 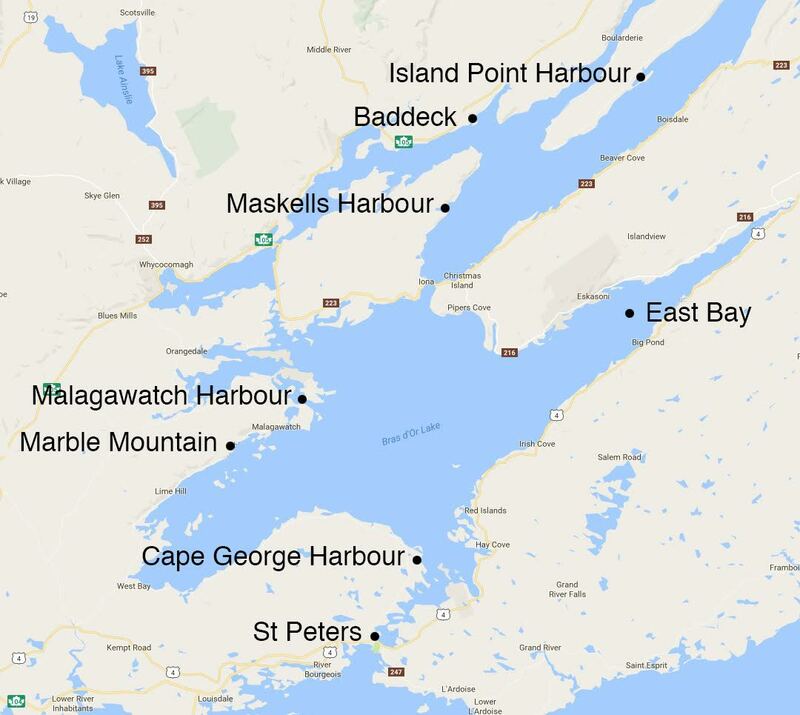 Our first anchorage was at Cape George Harbour in St. Peters Inlet, an anchorage favoured by local boaters. It was not particularly attractive and it had a steady stream of boats passing through, so we here happy enough to move on the next day to Little Harbour along the north shore of West Bay. It is a larger anchorage with a narrow entrance providing good protection from all directions. On our first night we were the only four boats in the anchorage. The second night we shared it with a ~55’ Selene trawler and a 90’ Burger yacht, among others. 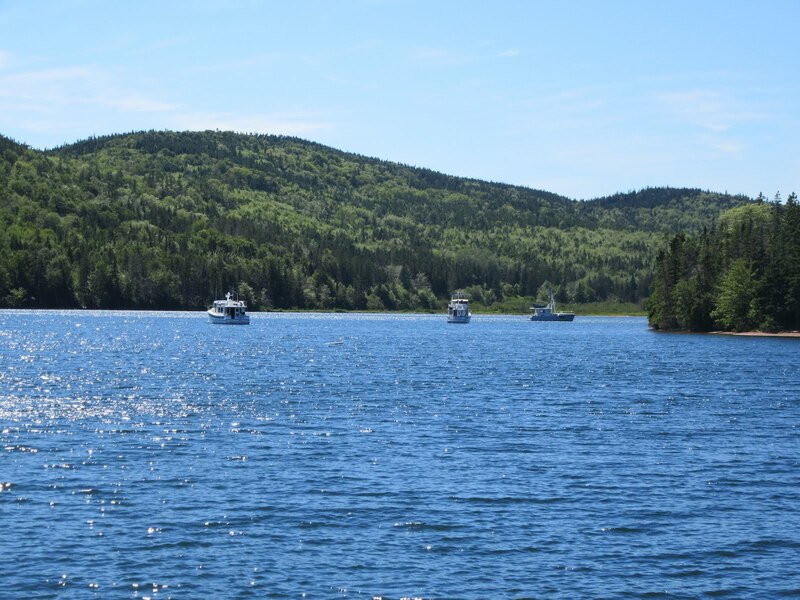 We’ve been surprised by the number of very, very large yachts that come to cruise Cape Breton’s Bras D’Or Lakes. It was delightful to be anchoring again and we kept ourselves busy with a few boat chores/projects and doing some exploring by dinghy as well as happy hours for board games with our gang. 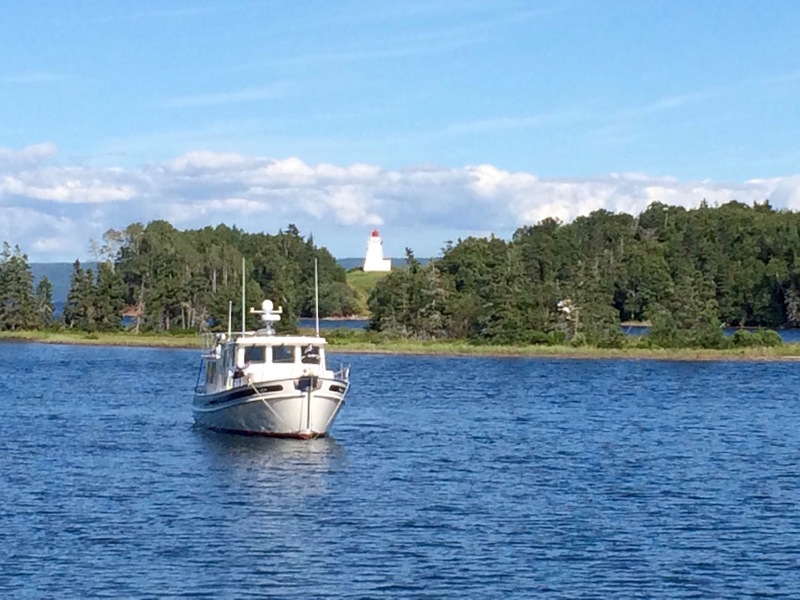 On Thursday August 10th we moved a short distance to explore Malagawatch Harbour, eventually anchoring in River Cove. While it was pretty enough, we woke up the next morning to a deck covered with microscopic bugs the size of finely ground black pepper that were tough to wash away. Also, when raising the anchor we hauled up some sort of large, abandoned aquaculture container for muscles or oysters, which thankfully proved simple to remove. 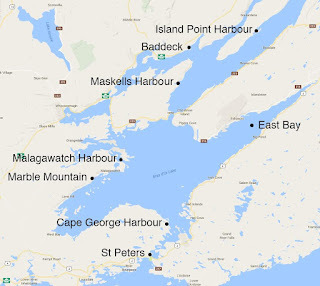 Our next stop for Friday and Saturday was through the Barra Strait into Great Bras d’Or Lake and into Maskells Harbour. It is a snug, well-sheltered harbour surrounded by high rolling hills with a long, low-lying sand and rock spit almost closing off the entrance. So far, this is about the prettiest anchorage we’ve seen. The water was clear and about 20 degrees C, the sun was bright and warm and the wind was light, making it irresistible, so I gave in an enjoyed my first salt water swim of the summer. Various boats came and when during our two day stay. We were intrigued by a local practice of both sail and power boats to run them up on shore (power boats) or run the keel into the sandy bottom (sail) for a few hours, then back off and head home. An added bonus at Maskells Harbour were the two resident bald eagles who spent hours watching for fish and swooping low over the water to attempt making a catch. They failed to complete a catch while we watched, but based on their healthy glow, we assumed they'd enjoyed reasonable success. 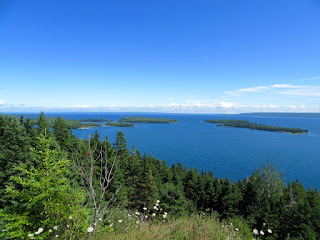 On Sunday we made our way to Baddeck for a few days to enjoy this most charming waterfront village and boating centre. Approaching Baddeck one can’t help by notice the lovely large estate on the hill above a point of land called Red Head. It is Beinn Bhreag, the old home of Alexander and Mabel Bell. Baddeck residents are justifiably proud of their former resident whom most know is responsible for inventing the telephone. Alexander Graham Bell was born on March 3, 1847 in Edinburgh, Scotland. Due to health issues experienced by Alex and his brother, the family moved to Brantford, Ontario in 1870 and shortly afterwards Alex moved to Boston to teach. Five years later, he had his telephone invention patented and then spend the next 18 years successfully fighting about 600 lawsuits over his patent. 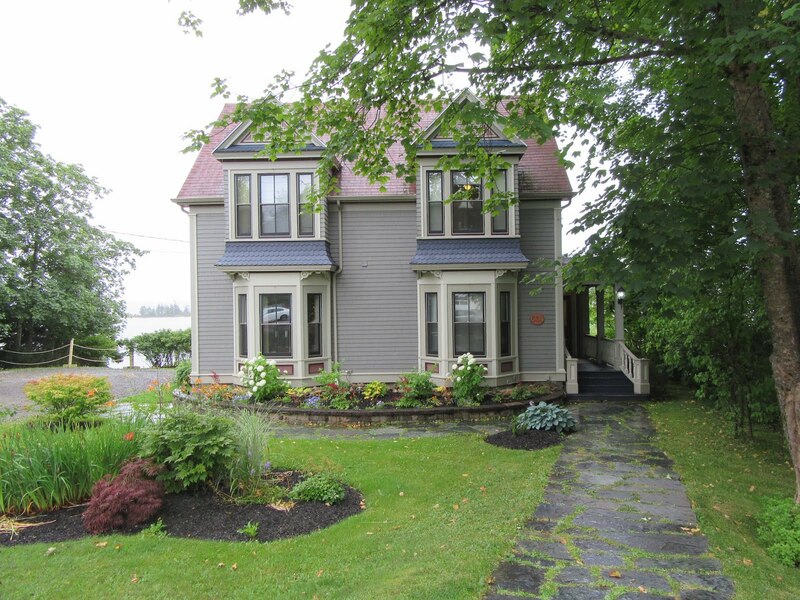 While on holidays in 1885, the Bell family visited Baddeck to see if it was as idyllic as advertised. 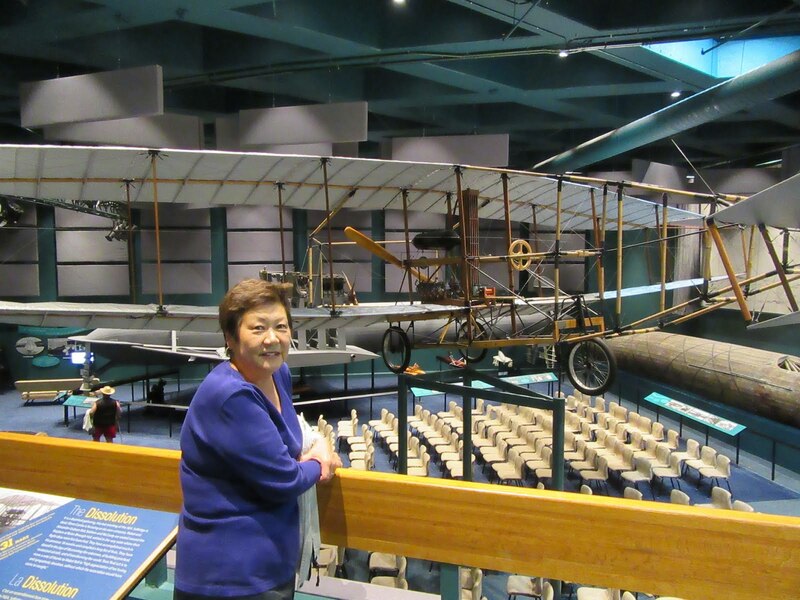 Falling in love with it, they bought property and built their home and this became Alex’s base for a vast array of inventions over the remaining 37 years of his life. In 1952, some thirty years after his death, his family decided there was so much more to Bell’s life that the public should know, so they donated the bulk of his photos, mementos, gadgets and gizmos to the Canadian Federal Government, who agreed to set up a museum in his honour. world recognized work in the field of deaf education, Both his mother and wife were deaf, profoundly influencing his life’s work. Alex and Mabel Bell’s own grandchildren did not know their grandmother was deaf until after she had died. They all assumed a family practice of taping the table when one was to speak was normal. That tapping action allowed Mabel Bell to know who to watch so she could lip read what they were saying. The Museum reveals the extraordinary heart and mind of a world-famous inventor whose genius helped shape the modern world. 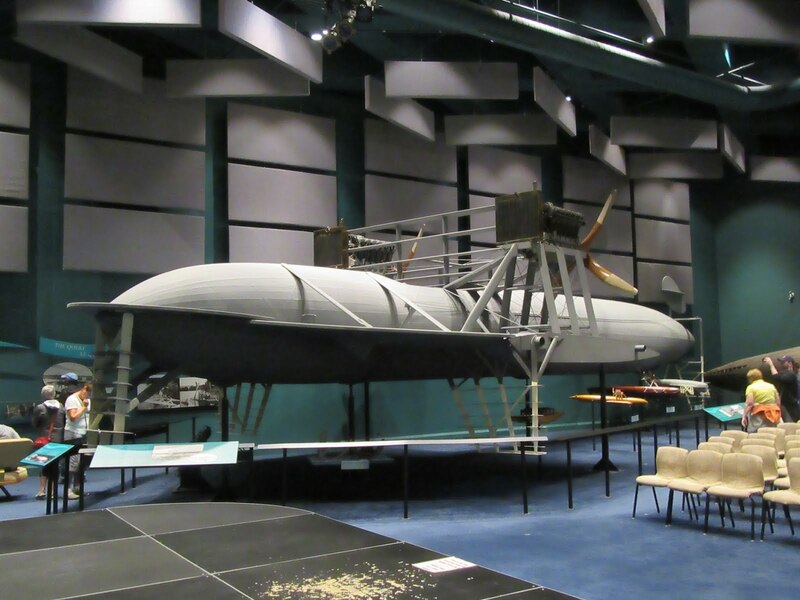 You can feel his legacy as you explore the remarkable artifacts, photos and full-scale replicas that mark his masterful career as an engineer, inventor, scientist and humanitarian. 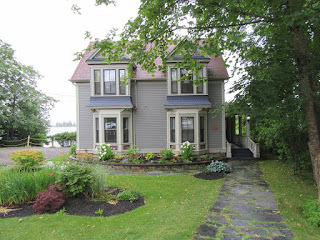 The Bell’s employed many Baddeck residents and stories still abound in the community from their descendants. Our tour guide’s great uncle worked with Bell in his laboratory at Beinn Bhreag. When visiting Cape Breton, its Scottish heritage the Gaelic influence is impossible to miss. The Royal Cape Breton Gaelic College was founded in 1938 and it is dedicated to perpetuation of the Highland Scottish Gaelic culture. Its curriculum includes Gaelic language, Gaelic song, Gaelic history, Gaelic storytelling, Gaelic drama, Traditional bagpiping, Cape Breton fiddling, Cape Breton step dance, Highland dance, Bodhran, Harp, Whistle and weaving. The Gaelic heritage is a source of great pride for the Cape Breton residents of Scottish heritage. We attended a Ceilidh in Baddeck. Nancy, a local resident has organized Ceilidh’s at the local parish hall, seven nights a week during the summer months for the past 16 years. The hall only holds 100 people and it is sold out every night. 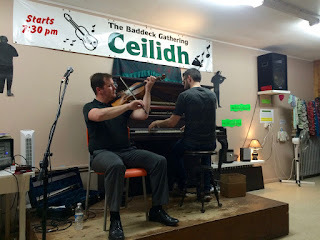 On the evening we attended, we had a fiddler and a piano player, both in their mid 30’s and they entertained us with a broad mix of Cape Breton and Scottish tunes, modern and traditional, ballads, jigs, reels and more. They are both teachers at the Gaelic College and perform regularly in Cape Breton and many other venues across the country. Both performers grew up on Cape Breton and were immersed in the Gaelic culture and Ceilidh gatherings since their youth. It was a great treat to experience this music and appreciate that this music’s roots in Cape Breton go back to the early 18th century and have changed very little since then. Baddeck Marine was the first time we’d ever used a mooring ball. When we first approached the “mooring field” it was alarming how close the boats are to each other. Each mooring ball is chained to a great block of concrete on the bottom and it has a large ~ 20” float on the surface of the water with two long pendants (ropes) that you pick up with a boat hook and tie to your bow cleats. In the rain we managed to tie up to the mooring ball and then we began to watch closely as the boats all swung on their mooring. We were nervous at first, watching the boats move to and fro, with different timing and you’d swear there would be collisions, but they all stayed in order and no bumps were witnessed. The closest we came to a collision was during a period with no wind and Tug’n just missed the boat in front of us, by less than 3 feet. We’ve been told there will be many more mooring fields in our future as we head further down the east coast. While in Baddeck we had a day of heavy rain day and found a small leak in our forward hatch over our bed. Temporarily I taped the perimeter of the hatch to stop any further leaking, while I collected the materials I needed to fix it when the weather allowed. After two great days visiting Baddeck, we headed off on Monday August 15 for an anchorage on Boularderie Island called Island Point Harbour. 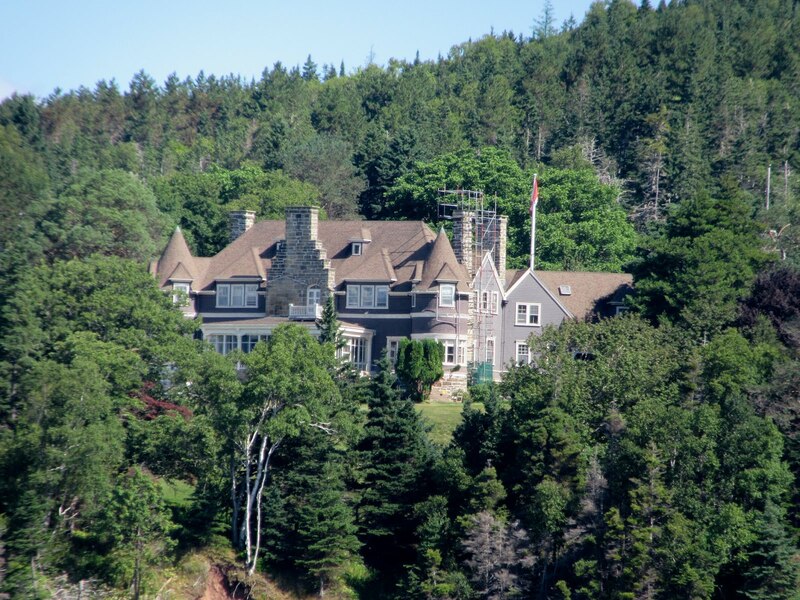 It was a beautiful sunny day allowing us to snap a few photos of the Bell estate as we left Baddeck. 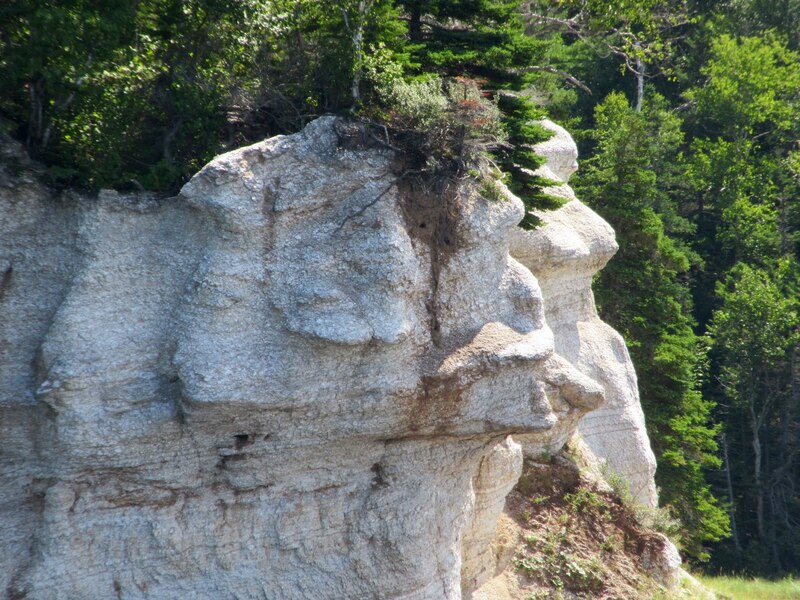 Travelling up St. Andrews Channel to our anchorage we passed many outcroppings of gypsum. The soft white rock is easily carved by the wind, rain and waves into various shapes allowing one to see faces, animals, angels and more. Our anchorage was lovely and well protected, but with the good weather I was more focussed on getting the hatch repair completed than enjoying the scenery. Removal of the hatch and frame went very smoothly with the two thin paint scrapers and wooden wedges Dave (from Sir Tugley Blue) loaned me. Removing all the old caulking from the deck and frame was another matter. Four hours later the clean up was done. Dave kindly joined me and took the lead on re-bedding the hatch frame in a most expert fashion and now, thankfully, our bed is no longer vulnerable in the rain. Wednesday turned out to be another 18 hour rain day, so the re-bedded hatch got a good work out and survived the test. Click on this pic. What do you see? Thursday, we headed to one of the anchorages recommended by my sailing friend and former colleague Denis, who lives and sails out of Halifax. It’s called Marble Mountain and/or Clark Cove. Marble Mountain is the name of a small village on Bras D’Or Lake. The name of the mountain that was mined for marble from 1869 to 1921 is North Mountain. The enormous scar on the side of North Mountain can be see from miles around. In the early 1900’s, the mine employed over 1,000 men and supplied marble all over North America for flooring, counter tops and high end furniture. The town even had a power plant, built to supply electricity to the mine and local homes, while the rest of Cape Breton was still using candles and lamps for lighting. 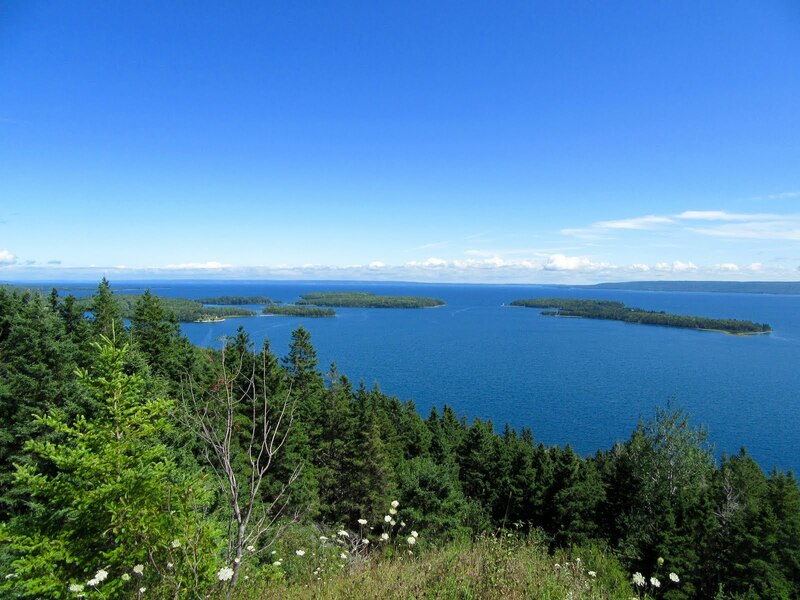 The area has many spots for anchoring and no visit is complete without a hike to the top of the marble quarry to soak up spectacular views of Bras D’Or Lake. 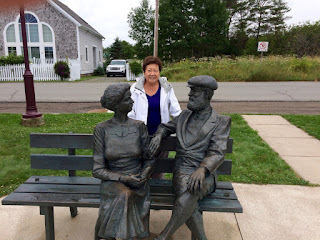 Friday August 19th was the end of our visit to the Bras D’Or Lakes. 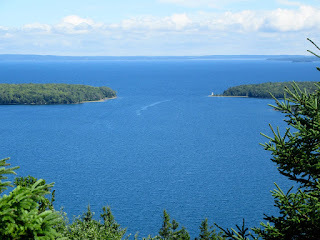 We were up early and off to St. Peters to do some chores and then commence our journey down the south east shore of Nova Scotia in the Atlantic Ocean for the first time on this adventure. Stay tuned!